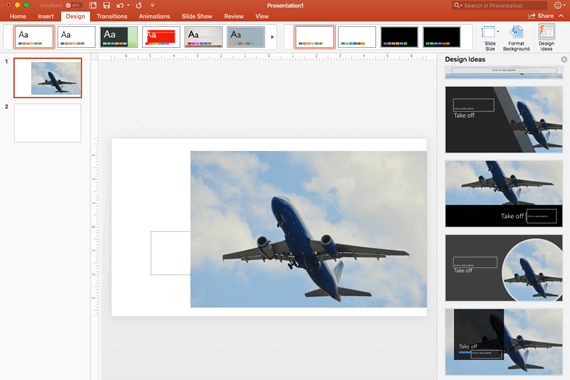 PowerPoint Designer improves slides for Office 365 subscribers by automatically generating design ideas to choose from. While you're putting content on a slide, Designer works in the background to match that content to professionally designed layouts. This is a subscriber-only, Office 365 feature. If you don't see the Design Ideas button, or you don't see certain features described on this page, read Requirements below for more details. Ask for design ideas any time by choosing Design > Design Ideas on the ribbon. The first time you try out PowerPoint Designer, it asks your permission to get design ideas for you. If you want to use Designer, select Turn on. To learn more, see the Microsoft Privacy Statement. Once you've turned on intelligent services, PowerPoint automatically shows you design ideas when you are creating your slides. Over time PowerPoint will learn from your experience using design ideas and show you design ideas at the appropriate time. Scroll through the suggestions in the Design Ideas pane on the right side of the window. Click to select the design you want, or else close the window. If you select one of the ideas, your slide is changed accordingly. You can also select another idea from the pane or go back to your original slide design: Press Ctrl+Z to undo a design change you've just selected. PowerPoint Designer detects pictures, charts, or tables on a slide and gives you several suggestions for arranging them in a cohesive, attractive layout. 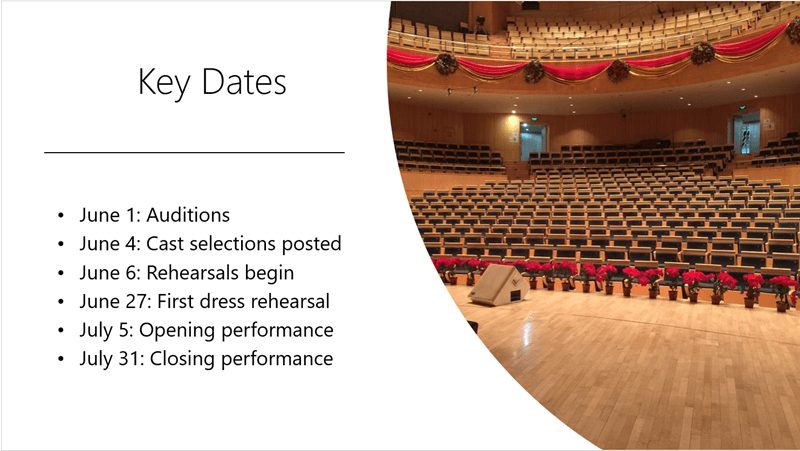 Designer can turn text such as lists, processes, or timelines into an easily readable SmartArt graphic. PowerPoint Designer watches for key terms and concepts that it has illustrations for, and it shows you those illustrations in various layouts. The Illustrations are from the Office 365 icons library. 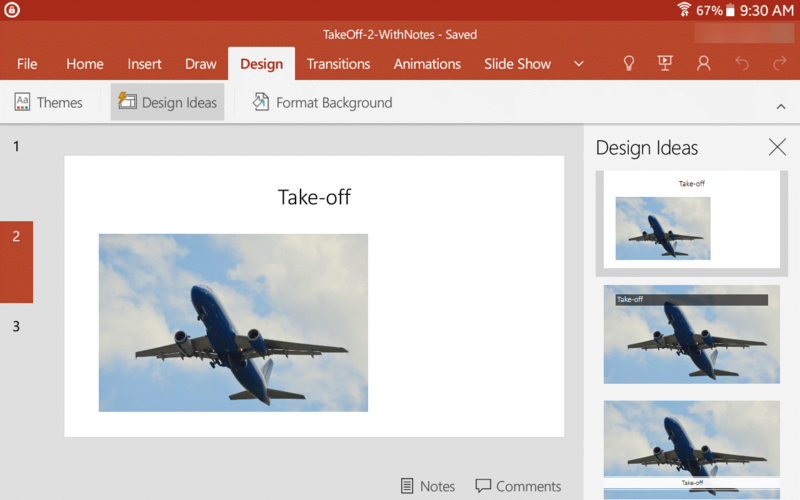 (Only for Office 365 subscribers) PowerPoint Designer recognizes when you draw or write with ink, and it incorporates that content into the Design Ideas it shows you. In the PowerPoint Options dialog box, click the General tab on the left, then scroll toward the bottom and clear the Automatically show me design ideas check box. The first time you try out PowerPoint Designer, it asks your permission to get design ideas for you. If you want to use Designer, select Turn on or Let's go. 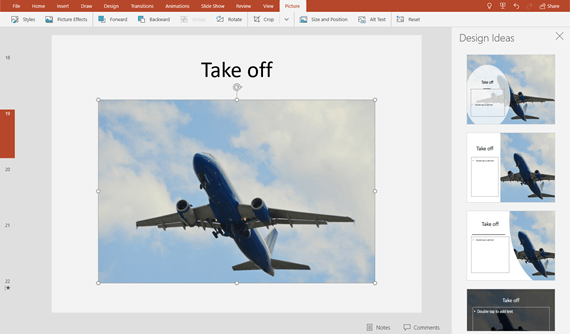 Once you've turned on intelligent services, PowerPoint automatically shows you design ideas when you add photos to your slides. You can ask for design ideas any time by choosing Design > Design Ideas on the ribbon. Under Authoring and Proofing Tools, select General. In the General dialog box, under PowerPoint Designer, clear the Automatically show me design ideas check box. 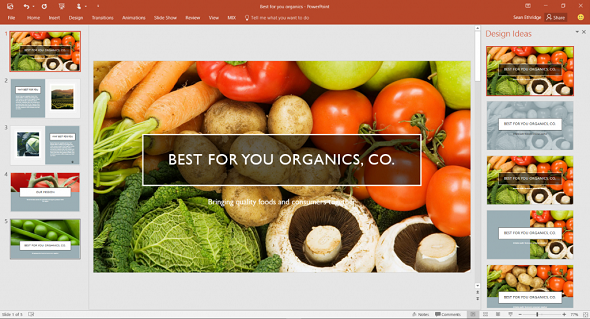 PowerPoint Designer is a feature for Office 365 subscribers. If you don't see the Design Ideas button, you're using PowerPoint 2016 for Mac rather than PowerPoint for Office 365 for Mac. This feature is available for files stored on OneDrive and SharePoint Online. If you don't see the Design Ideas button, or you don't see certain features described on this page, read Requirements below for more details. PowerPoint shows design ideas for your slide. If you're co-authoring a presentation with someone else and more than one person is actively editing a single slide at one time, Designer won't give design suggestions on that slide. However, as soon as there's only person editing the slide, Designer will begin offering design suggestions again once that person does an action (such as adding a photo) that Designer can respond to. 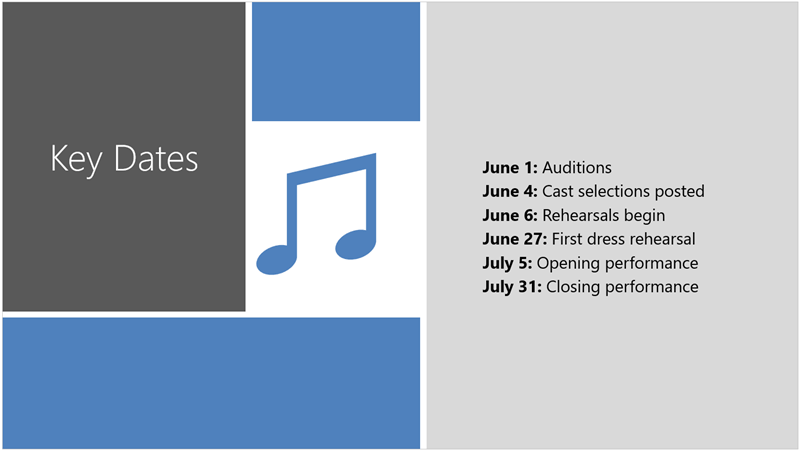 PowerPoint files stored in OneDrive, OneDrive for Business or SharePoint Online. PowerPoint Designer is available when you're using an iPad, but not an iPhone. Read Requirements below for more details. If you can see the Design Ideas button in PowerPoint but it's grayed out, it means you aren't connected to the internet. PowerPoint Designer is available when you're using an iPad, but not an iPhone. PowerPoint Designer is available when you're using an Android tablet, but not a phone. Read Requirements below for more details. PowerPoint Designer is available when you're using an Android tablet, but not a phone. 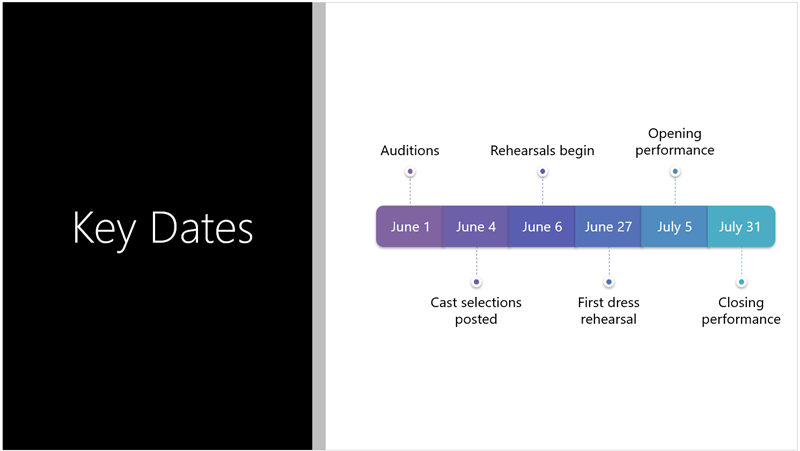 PowerPoint Designer is available when you're using a Windows tablet, but not a Windows phone. Read Requirements below for more details. PowerPoint Designer is available when you're using a tablet, but not a phone. Which problem are you having? On desktop versions of PowerPoint, only subscribers get design ideas. You can try or buy a subscription here. 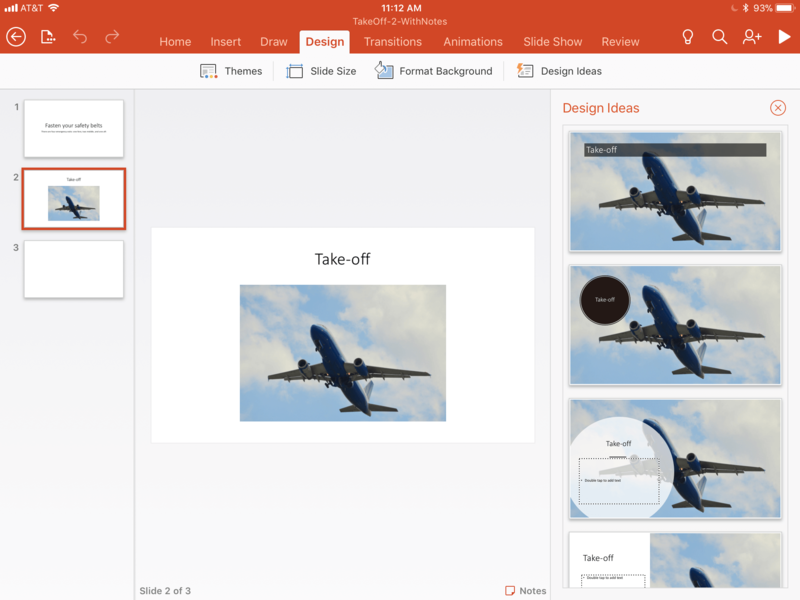 On PowerPoint Online, Design Ideas are available to everyone. One Office 365 subscription package doesn't include Design Ideas: Office 365 Germany. Go to File > Options and look for Office intelligent services on the General tab. See Enabling and disabling intelligent services for more information. PowerPoint Designer is a feature for Office 365 subscribers, but some organizations turn off the feature. 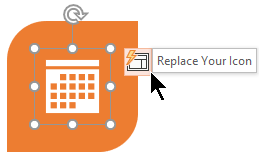 If you have an Office 365 subscription but don't see the Design Ideas button, ask your IT department. Sometimes users find that the first time they start PowerPoint after installing Office 365, the Design Ideas button isn't available. Restarting the app fixes this problem. Make sure you're connected to the Internet. PowerPoint Designer goes online to get its Design Ideas. Use a theme that comes with PowerPoint (not a custom theme or one that you've downloaded from elsewhere). Make sure your slide has either the Title or Title + Content slide layout applied. Don't use any additional objects or shapes on the same slide as your photo. Use a maximum of four photos (.jpg, .png, .gif, or .bmp) per slide, and make sure they're larger than 200 x 200 pixels in size. Make sure your slide has the Title + Content slide layout applied. Don't use any additional photos, objects, or shapes on the same slide as your process text. Because PowerPoint Designer is a relatively new service, it is still learning new tricks. If Designer can’t generate high-quality options for you, it won’t show any options at all. We're working hard to be able to generate great design ideas for more varieties of your content. And of course, if you don’t find Designer useful, you can turn it off by going to File > Options > General, and then clearing the box that says Automatically show me design ideas. If you are co-authoring a presentation with someone else and more than one person is actively editing a single slide at one time, Designer won't give design suggestions on that slide. PowerPoint Designer isn't able to suggest design ideas when a slide has a shape or text box drawn on it. You can have photos and you can have text in a placeholder. A single slide isn't selected. This can be the case when multiple slides are selected in the slide thumbnail pane in Normal view, or when the focus in the thumbnail pane is between two slides. It also is the case when the focus is in the Notes pane or you are in Slide Show view rather than Normal view.